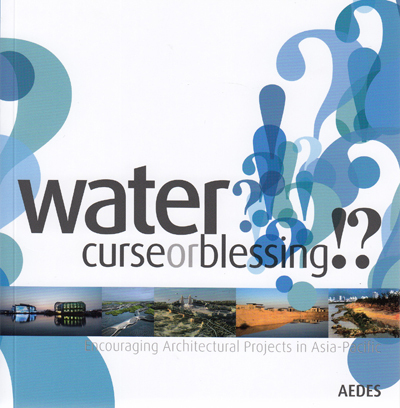 EXHIBITION: Water - Curse or Blessing!? The Asia-Pacific Weeks are supported by the Stiftung Deutsche Klassenlotterie Berlin (DKLB). Latest images of the exhibition are available here. The exhibition is a project of Aedes East International Forum Of Contemporary Architecture e.V., curated by Ulla Giesler. The exhibition Water–Curse or Blessing!? is a contribution by Aedes East e.V in the framework of the Asia-Pacific Weeks 2011, focusing on this year’s main theme Water, Food Production, and Health. Presented will be urban, infrastructural, architectural, and environmental planning measures from East, South and Southeast Asia. Designed to respond to water-related issues and challenges ranging from shortages to rising sea levels and flood threats or triggered by given geographical conditions. The exhibition will be accompanied by an interdisciplinary and intercultural discussion whose participants will include specialists and representatives from the fields of design, governance, technology and culture. Opening speeches: Rainer Seider, European & Int. together with KYONG Hak Min, Embassy of D.P.R. Ongoing changes to the global climate mean not just increases in extreme weather conditions, but also a rise in average temperatures worldwide whose outcomes may include the melting of the polar caps and glaciers as well as rising sea levels. At the same time, this situation is aggravated by growing water requirements around the world, in particular by economic players like China and India, but also other rapidly growing economies in East, South, and Southeast Asia. While some regions are continuously threatened by rising floodwaters, others must battle the consequences of water shortages and the resulting drought conditions. Alongside the unpredictable ecological outcomes involved, is in particular human settlements located near large bodies of water which are threatened: of the more than 50% of the world population which lives in cities (and the growth of megacities in Asia means that this number is rising), nearly 90% are located in the vicinity of oceans or rivers. It is urgent that these communities develop sustainable strategies for integrating evolving climate conditions into urban planning measures and architectural projects. The exhibition Water–Curse or Blessing!? focuses on the question of how architects and urban planners in the Asian-Pacific region are coping with such water-related issues. The selected projects offer insights into specific scenarios found in the urban areas of the neighboring lands of China, India, both parts of Korea, Thailand, Indonesia, Taiwan, and Singapore, all the way to Australia, while also incorporating a larger perspective of the region as a whole, which faces a heterogeneous mix of water-related threats and issues ranging from flooding to shortages, including pollution and other challenges. The featured projects fall under the categories of water management, water processing, rainwater harvesting, desalination, flood protection, and infrastructural improvements, for example enhancement of the quality of life in urban areas through the revitalization of abandoned industrial zones. Such searches for answers are conditioned in complex ways by the goal of social and ecological sustainability. Take Australia for instance: on the one hand, water is a scarce commodity, so buildings and infrastructure must be constructed in ways that conserve this precious resource and reduce water use as far as possible. On the other, architects face challenges related to the recurrent flooding of the kind which struck in January of 2011, and which consistently affects large areas of the country. The Tanker project, brainchild of Melbourne designer Tom Morgan of the office Sharkmouse, proposes a strategy for coping with bushfires, an ever-present danger in Australia. His vision is of an “intelligent” and, more importantly, mobile building which protects residents automatically from bushfires through a built-in sprinkler system fed by rooftop tanks. In his study Tidal Garden, Richard Black - senior lecturer at RMIT University in Melbourne and head of the office Times Two Architects - presents his concept for coexisting with the Murray River, one of the most important sources of freshwater in Australia's southeast, and the country’s second longest body of water. As a consequence of elevated water demand and multiple damming, less and less water is reaching the river's mouth, and the riverbed threatens to silt up. Richard Black takes up this scenario and presents his “mobile landscape,” based on the idea of integrating the river’s changing water levels into the architecture of local buildings. Likewise, Carrara Lakes, a project of Ross Brewin - lecturer in architecture at Monash University and independent architect in Melbourne - is a visionary analysis that deals with an area within Australia’s currently most rapidly growing urban region, namely Gold Coast City in the vicinity of Brisbane on the country's east coast. This urban scale development proposal preserves the floodplain and the existing river system and supports the area’s function as a water storage infrastructure and biotope. Whilst doing this, the project accepts the inevitability of the residential development of large tracts of privately owned land within the floodplain and attempts to negotiate these two competing urban pressures. The central element in the scheme is an artificial lake designed to connect waterways with one another and intended to serve as the social fulcrum of this growing city. In China, growing water demand is increasingly a problem, since the water of its numerous rivers has been rendered largely unusable due to discharges of unfiltered wastewater. “70% of China's rivers are polluted which means that water shortages are a self-inflicted problem,” explains water conservation expert Wolfgang Geiger. The Chinese public is aware of the issue, and pressure on the government grows apace: “Virtually every second issue of China Daily issue deals with water problems - whether floods, shortages, or pollution.” For this reason, water purification and sustainable water utilization are core themes for Chinese architects and landscape planners. The town and landscape planners of the Chinese office Turenscape in Beijing provide answers in the form of the ecological and sustainable riverbank design. Under the guidance of Kongjian Yu, architect and professor at the College of Architecture and Landscape Architecture, the office develops innovative processes designed to make such zones attractive for urban residents, thereby heightening consciousness of the cultural value of water as a feature of the urban environment. The project Flood Control: The Floating Gardens is an instance of such an integrated approach. In the city of Taizhou, set along the East China Sea and home to 5 million people, the abandoned and neglected shoreline of the Yongning River has been revitalized and transformed into a public park via only minimal interventions. Info-boxes inform visitors about the process of transformation and the importance of natural resources. Today, the riverbank serves not only as recreation area for the urban middle classes, but also contributes to floodwater protection in an ecological manner: the marshes, planted primarily with bamboo, serve to balance fluctuating water levels. A similar situation prevailed in the northern Chinese city of Tianjin, where Turenscape became active on request of the local citizenry. In the framework of the project Tianjin Qiaoyuan Park: The Adaptation Palettes, an urban district which had formerly served as landfill and firing range was transformed into a public garden. Before the 21 variously sized ponds could be laid out and planting could begin, the pH levels of the alkaline soil had to be neutralized. During the rainy season due to high groundwater levels, the ponds become filled and thus not only work as water storage, but also as filters. The project’s implicit approach is to “let nature work,” so landscaping measures - aside from the creation of the ponds and the initial plantings – have been minimized. The result is a naturally-grown biotope at the heart of the city. The project Shanghai Houtan Park: Landscape as a Living System was realized in the framework of the EXPO 2010 World's Fair, and embodies an approach which responds to heavy river pollution by emphasizing water purification. Additional elements include ecological flood protection and urban rice cultivation. Eliminated to begin with were the former steep banks of the Huangpu River, which flows through the eastern Chinese metropolis of Shanghai, after which the riverbanks were decontaminated and finally planted with vegetation. The initiative strove to revive this former industrial wasteland as a publicly usable recreation area while recalling the zone’s former utilization by preserving some of its industrial steel structures. In a comparable way, the Dutch office MVRDV has developed a master plan - entitled Xinjin Water Town - for the town of Xinjin in the vicinity of Chengdu in central China - one of the country’s rapidly growing urban centers. Five rivers converge at Xinjin, so life in close proximity to water has long been taken for granted by its inhabitants. The architects from Rotterdam are known for their provocative approaches, as exemplified by the project Pig City, but also for large-scale urban planning projects. Here, they plan to expand the network of waterways which are criss-crossing the town, giving rise to a new city center for residential and commercial spaces through the creation of a complex of islands on the river. Through an ingenious system involving the design of the riverbanks of these islands, recurrent flooding is averted, while the river nonetheless remains accessible to residents. Beidaihe EcoCity is an instance of a successful German-Chinese collaboration. Together, the young architects Daniel Schwabe and ZOU Yingxi have built up the architectural firm Synarchitects, based in Berlin and Beijing, with a focus on energy-efficient cultural, residential, and office buildings. Their large-scale project for the town of Beidaihe envisions the transformation of an industrial fishing port into a modern, sustainable urban district for 20,000 residents. In addition, fallow industrial land is being converted into residential and leisure facilities, while the local economy - formerly based on aquaculture - will now shift towards tourism. Energy requirements for the town are to be fully covered by renewable sources, making the eco-city of Beidaihe CO2 neutral. Pu Miao, a Shanghai architect and professor at the School of Architecture, University of Hawaii, sees natural water as a resource to alleviate Chinese urban residents‘ increasing isolation from nature. The rapid urbanization in China has eliminated many natural water areas in ever sprawling cities of high density. Various regulations further keep people and buildings away from remaining rivers and ponds. As a result, today’s urban children often forget the feeling of natural water. Pu Miao tries to address the problem, at a micro scale, by designing buildings that stimulate intimate relationship with natural water. Located next to a preserved river in a town near Shanghai, his Sichang-Road Teahouse in Kunshan has tea rooms that are sunken glass pods surrounded by water. Just like in a boat, people can open the pods to touch the water under their elbows. All these are beneath the shades of waving green trellises. It is hoped that the effort will rekindle people’s first love with nature and generate the public demand for a more holistic urban environment. In India as well, an effective approach to the utilization of water resources is a matter of great urgency. Fully 80% of water reserves are needed for agriculture, but as a consequence of antiquated canal systems, only a fraction of that amount ever reaches the fields. Moreover, groundwater levels are sinking rapidly, partly as a consequence of the elevated water demands associated with ongoing urbanization, and partly due to decreasing rainfall. The country's northwest in particular is severely affected. But water pollution on the subcontinent is an even greater problem than water shortages. “Our rivers and reservoirs are being poisoned by heavy metals from industry and chemical fertilizers and pesticides,” explains environmental activist Ganesh Pangare. India´s future challenges include the need for effective water storage, processing, and purification, as well as the optimization of water transport infrastructures. Among small-scale initiatives which work in sustainable ways with reduced budgets and correspondingly greater creativity is the project The Living Building of the artists’ initiative Jaaga, set in Bangalore in southern India. Founded by Archana Prasad and Freeman Murray, Jaaga (meaning “space”) offers artists, technologists and eco-activists a platform to share their ideas. What makes Jaaga particularly unique is that it's building itself is an ever evolving social, environmental & technical experiment. The Jaaga building can be thought of as a public art installation. A space constantly in flux, reacting to the inputs, demands and desires of its inhabitants and surroundings. In collaboration with creative personalities from around the world, the building - a structure made of palette rack shelving has been converted and outfitted along sustainable lines; nearly 80% of energy requirements are satisfied by solar cells, while cooling and noise insulation are provided by a vertical garden measuring 70 m2, which features domestic plants such as basil, spider plants, garden crotons, and gazania. The building’s water supply, including requirements for the garden and the vegetable cultivation taking place on the roof terrace, is derived from the harvesting of rainwater, and remains in circulation through a resource-conserving hydroponic hydrosystem. Currently this project has been dismantled and moved to a new neighbourhood in Bangalore – growing to be more than twice the size of its previous avataar. Located outside the western desert city of Jaipur in the Indian state of Rajasthan, Mumbai based RMA architects designed Hathi Gaon - Village for a Hundred Elephants, a low-cost housing project for one hundred elephants and their keepers. Social and ecological concerns are the focus of this integrated approach: the harvesting of rare and precious rainwater in water bodies that are carved out of the lowest topographical points on the site. The layout of the project integrates residences for both the elephants and their keepers (called Mahouts). The water bodies created and replenished in the monsoon season serve as bathing places for the elephants, which is critical for their well-being. More importantly, the introduction of this element has triggered a process of ecological regeneration, perpetuating native species as well as attracting migratory birds, thus creating a micro-climate that alludes to the tropical environment which is the natural habitat of elephants. The ferry known as M.V. Chandardinga – which lies in anchor off of Guwahati, capital of the northeastern Indian state of Assam – is the basis for the project Periferry, initiated by Sonal Jain and Mriganka Madhukaillya from Desire Machine Collective. The name Periferry is a play on the words “periphery” and “ferry,” and takes up the situation of the river and its numerous ferryboats, whose significance is gradually disappearing with the relocation of transport routes from water to land. It encourages a local-global dialogue and provides a space – both in literal and metaphorical ways - to counter both hegemonic art discourses and grand narrative of history. In doing so alternate art practices and ‘micro histories’ can be explored and the every concept of centre-periphery dichotomy is challenged and subverted. The project aims to promote experimentation in art, ecology, technology, media and science and to create a public space and public domain, physical as well as virtual for critical reflections. For the exhibition, Perriferry has conceived an installation whose subject is the Brahmaputra River, the largest in eastern India. The deltaic islands which are bordering the Sundarban forests in West Bengal have been and continue to be an inhospitable terrain. For political as well as economic reasons, the forests have been shrinking – giving way to human settlement which is why the islands are very much vulnerable to cyclones and tidal inundations which are coming up regularly in the area. The silting up of the river network and natural predators like the Bengal Tiger add to woes of the local people. The villages and communities are dependent on the forests and the rivers for their livelihood so any resettlement would result in a loss of income for them. It is beyond doubt that the people will go on living here despite the hardships. Given this scenario the workshop Designs on a Delta, initiated by the artist collective KHOJ in Kolkata, attempted to study and suggest design interventions that would benefit the local people. The output is a design of stilt-based houses that are made of locally available materials. Only recently, KHOJ started the collaboration with corporate partners and is currently implementing their proposal. For the Southeast Asian city state of Singapore, water autonomy is a top priority and the driver behind an island wide urban water management strategy. A tropical rainforest climate provides plenty of water, however this falls in fierce downpours which create a challenging situation in terms of flood management and water quality in a densely populated city environment. What is the best way to capture this water for drinking water while at the same time creating great city spaces for people and not excluding nature? Singapore’s Public Utilities Board collaborated with Atelier Dreiseitl, a multi-disciplinary planning team, to create a visionary and pragmatic approach to water sensitive urban design in the tropics. The ABC Water Program stands for active, beautiful and clean and is inspired by people. In a unique planning approach, Singapore Water Department has fostered a collaborative process which both activates community engagement and incorporates innovative water design. Especially unique is Singapore’s ability to mobilize multi-departmental forces to turn visions into a built reality. Bringing water back into the lives of local inhabitants is a vital necessity. Restoring the natural cleansing potential of water creates accessible water systems which can be enjoyed by people while providing space for an abundance of flora and fauna. Increased access means increased appreciation and a sense of connection and responsibility. This people-inspired restoration process is based on a public realm integrated infrastructure which manages water as a valuable resource, ultimately using nature to best preserve rainwater for use as drinking water. The ABC guidelines map the road for the transformation of Singapore’s public realm into amenity water infrastructure. As part of the first implementation phase of the ABC master plan for the 140 square kilometer Kallang River urban catchment, Bishan Park River Restoration is a pilot project which transforms a 3 kilometer section of the Kallang River from a concrete drainage channel into a meandering river with dynamic natural river processes. Singapore’s busiest park has become a river landscape subject to natural rhythms and with lots of space for people, nature and fresh river water. The sinuous length of the river and the flood spaces extend the storage capacity of the whole river system while natural treatment systems improve water quality. Kallang River has been transformed into a water management asset, part of a decentralized system which will safeguard Singapore’s drinking water supply. Atelier Dreiseitl’s work in Asia extends from Singapore to China to the Philippines and Taipei, and is assisted by offices in Singapore and Beijing. Taipei Telecom Park in Taiwan, is an holistic new 24 hectare city. Regenerating an old industrial site, the masterplan is inspired by a stormwater concept which captures rainwater where if falls to create attractive and communicative outdoor city spaces while at the same time reducing flooding of the adjacent city river and significantly improving water quality of the river. Whereas previously rainwater had always been a threat, the design has metamorphosed rainwater into a benediction which softly forms highly desirable living and work spaces. In the form of a newspaper and news broadcast, the architectural office WOHA from Singapore presented a light-hearted science-fiction scenario, their Visionary Masterplan for Singapore 2050: “Architects and urban planners re-emerge from oblivion and return to their roots of benevolent megalomania”: according to the architects working around Wong Mun Summ and Richard Hassell, this is the new (albeit not entirely serious) motto. A visual impression of the city’s future as envisioned by the Masterplan is provided by a glance at the newspaper they published, entitled "Strange Times", a spoof of "The Straits Times", Singapore's most-read English-language daily. The entire edition, including advertisements, is oriented conceptually toward the Singapore Masterplan 2050, and thematizes the imminent tasks with regard to ongoing structural development which confront decision-makers in this city state: to provide reliable energy sources while at the same time reducing the carbon footprint; to cope with the threatening rise of sea levels while ensuring adequate drinking water supplies. WOHA is the recipient of the 2007 Aga Khan Award for Architecture, they received 4 RIBA International Awards in 2010 and 2011. In 2006, Aedes presented their work in a joint exhibition with architect Mok Wei Wei. Worldwide, 90% of cities are located on the coastlines of oceans or along rivers. At the Dutch architectural office Waterstudio NL, founded and directed by architect and urban planner Koen Olthuis, the focus is on strategies for shifting human habitats from land to the ocean’s surface. Koen Olthuis explains his innovative approach: “In order to confront the consequences of climate change, we are attempting to develop strategies for making cities more flexible. The use of water to separate building from site makes it possible to react rapidly to change while at the same time preserving the environment.” The Floating Mosque in United Arab Emirates is one example. The design is representative of the combination of traditional function and contemporary design. Light is provided to the mosque, which floats on the water's surface, through funnel-shaped ducts set into ceilings, while seawater is pumped into the walls in order to provide the necessary cooling. Located in Democratic People´s Republic of Korea, somewhat removed from the capital city of Pyongyang, is the potential site for the project Vision: Green Housing, conceived by architect Il-O Ri of the Paektusan Architecture Academy. The core of this vision is the laying out of environmentally-friendly apartments whose wastewater is cleaned along with collected rainwater by a purification plant (which would run on renewable energy) before reentering the circuit. Water storage facilities are located in the building's basements or attic stories. Similar to the scenarios in other asian countries, also in Thailand, different factors such as economic, industrial and agricultural growth as well as the rapid population increase determine local water management. Especially the high population density in the urban agglomerations of Bangkok and Chiang Mai turn out to be problematic, simply because there is not enough space that can be flooded in order to compensate the regular stormwaters. Presented will be visions which consider the shift of habitat from land to water surface as a solution for this challenge. With A Post Diluvian Future, Songsuda Adhibai, Ponlawat Buasri and Taylor Lowe - the young architects of the Thai firm S+PBA - provide an approach to the problem of rising sea levels and their likely consequences for the rapidly sinking capital city of Bangkok. Inspired by the singular architecture of Koh Pan Yi, a village in southern Thailand, all of whose buildings are supported on stilts which elevate them 1.5 m above sea level, as well as the native Mangrove Stilt Tree, the biological equivalent of Koh Pan Yi aquatecture, these architects have configured a so-called “Wetropolis.” Constructed entirely from renewable materials, the realm above the water surface is now opened up as a new habitat that allows residents to inhabit a city predicated on the recognition of flooding as a constant and not as a crisis. New conceptual tendencies with regard to future city planning are also exemplified by Sunny Water Lillies, a study by the Dutch The Why Factory, a global think tank and research Institute initiated and operated by Delft University. Against the background of the perpetually growing population found in the urban areas of Thailand, the architects envision future cities, which appear as floating “flower islands” set on the water’s surface – a kind of „flourishing vision”. The Why Factory investigates possible forms of urban development and visualizes plausible future scenarios. With a width of up to one kilometre, the river Han flows through the centre of the South Korean capital Seoul, dividing it into north and south. As a result of rapid urban development, the riverbank zone – formerly occupied by rice cultivation – has been fully absorbed into the urban fabric. As a consequence of infrastructural development, the riverbank has lost much of its ability to protect against rising water levels and has become disconnected from the city and its inhabitants. In the framework of a measure entitled the Han River Renaissance, initiated in 2007 by the government of the City of Seoul, various projects are currently under implementation in the capital, with a special focus on improving water quality, flood protection, ecological revitalization, and the reshaping of the riverbank zone into a public space for urban residents. The Han River Access Tunnel Project illustrates such efforts as it is distinguished by the strategic development of floodwater protection as well as the simultaneous reimagining of public space. With Lokaldesign/Haewon Shin as design coordinator, a group of young architectural practices including Jegong Architects and Ateliers Lion Seoul, developed welcoming and functional designs for the hitherto neglected underpass system. Formerly regarded as purely infrastructural in character, the tunnels form the main access routes to the Han Riverside Park for urban residents, while their powerful floodgates offer protection to the surrounding neighbourhoods against rising waters. Today, they provide much needed public spaces for urban inhabitants with a functional dimension. The project entitled Seoul Floating Islands, the brainchild of architect and city planner Taeman Kim who formed the design team from HAEAHN in Seoul and H-Architecture in New York, is also a component of the large-scale undertaking grouped under the heading of the Han River Renaissance. Created and installed on the river’s surface with the objective of bringing the river closer to urban residents again are three floating islands, named Vista, Terra and Viva, which will be used as venues for cultural events. At the geographical crossway in Seoul, which connects east-western blue axis of Han River and north-southern cultural axis of green spine of Seoul, the site is considered as the most effective spot to revive the urban vitality. With the double-deck bridge nearby which was transformed into a pedestrian friendly passage of almost 1.5 km length equipped with dancing waterfall, the project gives the city of Seoul not only the iconic feature but also vital venues for urban-green lives. The exhibition Water–Curse or Blessing!? not only showcases answers to pressing problems, but also offers an orientation to the local particularities of the Asia-Pacific region while making a contribution to the larger debate over the topic of water, a resource so vitally urgent for our collective future. 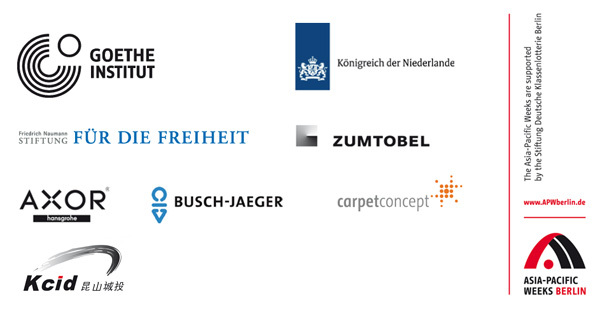 Thanks to all participating architects and designers. Without their various contributions and the effort they made, the exhibition would not have been possible! The exhibition designer Christine Meierhofer, in cooperation with the curator Ulla Giesler and Eva Wildhardt, assistant, have developed the exhibition layout in which framework the architects and landscape designers could realize their ideas and concepts.